The centenary of the outbreak of World War I provided the impetus for research into an intriguing document preserved in council’s archives. Headed War Census replies - Woollahra branch, the record lists the names of some 3,000 male residents from the local area, with notes as to their willingness or otherwise to enlist for war service. Dates scattered throughout the entries indicated that the listings concerned recruitment for the First World War. Further investigation revealed that the document recorded the local follow-up to a Federal Census taken in September 1915. Designed to determine the resources - men and money - available for the national contribution to the British war effort, the census results provided a basis for Commonwealth planning and policy. The recruitment drive which followed, however, relied upon the support and involvement of local government and local communities across the nation. In the first days of the war, when Australian support for Britain was extravagantly pledged to "our last man and our last shilling", the ultimate demand which would be made upon the nation's human resources was unimaginable. Similarly unforeseeable, in the heady atmosphere of an initial enlistment rush, was the eventual development of a recruitment shortfall. As time went on, however, there was less to inspire and much to discourage the prospective recruit. 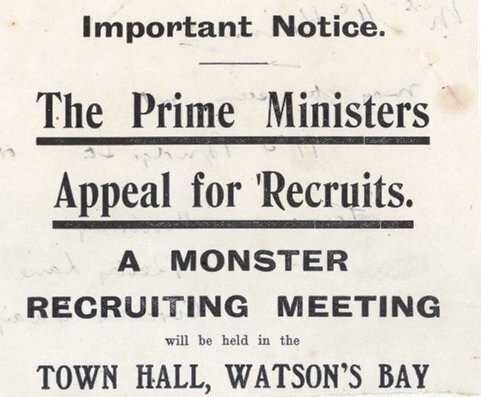 For the Australian authorities – heavily committed to a supply of men well over and above reinforcement levels, and reluctant to introduce conscription without guaranteed public support – recruitment became a major challenge of the war. In July 1915, with the extent of the European challenge growing increasingly apparent, the Australian government passed the War Census Act (1915) instigating a sweeping survey of the ultimate resources which might be placed at the nation's disposal for the war effort. Schedule 1 of the Act addressed the need to calculate available manpower, both to supply the war front and to maintain industry and services at home. Schedule 2 addressed the determination of nationwide wealth held in private hands, both corporate and individual. Males aged between 18 and 59 were the targets of Schedule 1, which required completion of "Personal" census cards posing a range of questions concerning the personal circumstances, age, physical fitness, skills and expertise of its respondents. Schedule 2 required any adult in receipt of an income or possessed of assets to declare them on a "Wealth and income card", with parents and guardians responsible for declaring the income and assets of the minors in their care. The public generally do [sic] not appear to realise that practically every person has either to make a return or have a return made on his or her behalf. In the light of this commonwealth concern, local authorities were asked to raise community awareness of the census. The war census was conducted between 6 and 15 September 1915, administered by the Commonwealth Bureau of Census and Statistics. The onus was placed upon citizens to collect, complete and submit census cards as required, with local postal agencies acting as distribution and collection points. Local councils were asked to play a supporting role by helping residents to understand and interpret difficult questions. The many volunteers who had expressed interest in assisting in the census process were referred to their local council for deployment. Before the close of November, the Commonwealth Statistician was able to report that some 600,000 "fit" men of military age – 18-44 years old – had filed "Personal cards" in the War Census returns. Based on these numbers and British need, the Commonwealth government announced its intention to despatch an additional force of 50,000 men as well as the ongoing monthly reinforcements of 9,500. With the Census declared, recruitment drives began. The nation was divided into recruiting areas, each of which was allocated a quota of men to raise. Recruiting committees were formed at local level and recruiting sergeants appointed. Commonwealth responsibility for encouraging recruitment was now shared with locally organised units providing leadership at community level. 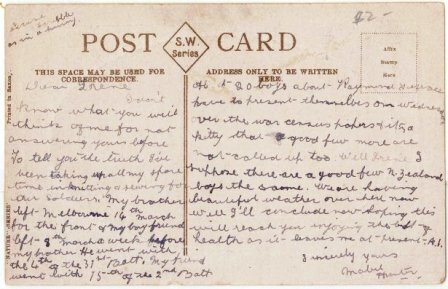 Enlistment cards ("war cards") were issued from the Federal government to Australian men aged between 18 and 45, asking for an indication of their enlistment intentions and an explanation for a negative or noncommittal response. The returns received from men in Woollahra were entered into the War Census volume, including a summary, where relevant, of the reason given for the reply. The detail filling this volume neatly illustrates the process of this recruitment strategy, from the initial census and "war card" replies, to the local follow up - usually a personal interview - by the local war committee or recruiting sergeant, with notes made at each step. We know from correspondence held in council archives that Lieutenant William O Hug, based at a recruiting office in Bondi Junction, was the recruiting officer for the division of Wentworth which covered the local areas of Randwick, Waverley, Woollahra and Vaucluse. Vaucluse alderman Edwin Sautelle was actively involved in the recruiting drive. His son Edwin enlisted in 1915 and was killed in action in Belgium at age 20 in 1917. The final pages of the Woollahra volume are dedicated to a list of over 300 names marked as "Negative replies which are being dealt with by the Central Enquiring committee". The Sydney-wide pattern cited by the Herald is closely mirrored in the replies given by local men, as detailed in the Woollahra record. To these replies can be added, from the local response, the pleas of the self-employed with businesses to be lost, the concerns of men with elderly parents or disabled siblings to support, the young man who deemed himself medically unfit due to acne, and another who felt himself ineligible due to "insufficient teeth". A surprising number of men were ready to declare that their wives had refused them permission to enlist. Evasive replies were not uncommon and impertinence represented by one local respondent who would not consider enlisting unless offered an officer's commission. The January 1916 Herald account suggests that Woollahra men were no more ready to embrace immediate enlistment than the men of other Sydney municipalities, reporting that of the "several hundred replies" already received by the town clerk of Woollahra, in only 16 instances had men indicated their preparedness to enlist at once (Sydney Morning Herald, 12 January 1916, p.12). That this early trend continued is resoundingly borne out in the completed War Census replies volume, in which the first column, headed "Will enlist now or have enlisted", is all but filled on every page with entries stating "no", punctuated with an occasional "yes", or an even less frequent note "enlisted" - at least one instance of which is followed by the further note "killed in action". Taken in its entirety, the document recording Woollahra's War Census replies is a portrait of a community at one of the more divisive periods in the nation's history, when one group of citizens was pressured to make a potentially all-consuming sacrifice on behalf of the whole, with little social latitude allowed for individual choice or alternative viewpoints. 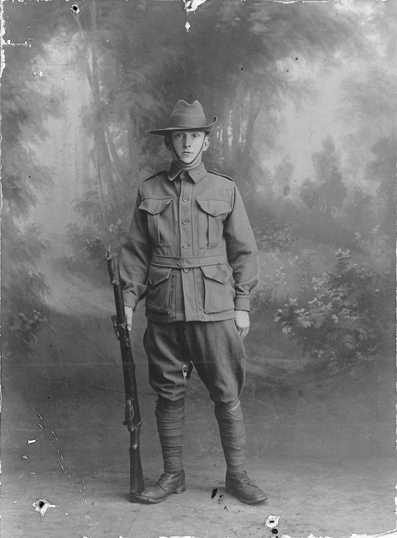 "About 20 boys from Raymond Terrace have to present themselves over the war census papers and it's a pity that a good few more are not called up too. Well Irene, I suppose there are a good few New Zealand boys the same ..."
Beyond the specific Commonwealth directives defining its role in recruitment, local government found many other means to be a rallying point for the men of the area. The call to enlist having been fashioned as an appeal to personal character, a prime means of persuasion was the public commendation of local volunteers - recruitment by example. Frequently council administrations served as a nucleus for the various patriotic movements active within a district, and aldermen often exercised a steering hand. Municipal honour rolls were an obvious enlistment tool, and one of the more conspicuous demonstrations was the Municipality of Paddington's, where the lists of the area's serving men were prominently displayed on the facade of the Oxford Street Town Hall. Not only were the rolls in full view of a busy street, but the proximity of the Town Hall to the Victoria Barracks would have been lost on few passers-by. In Vaucluse, two former aldermen separately presented their council with polished wooden tablets ready for inscription, which together recorded the service of the men of the district. Australian flags embroidered with the names of men stationed at South Head were also painstakingly crafted by local women for display in the Vaucluse Town Hall in Military Road, Watsons Bay. Honour rolls were not limited to local councils, and during the war years appeared in churches and schools and other local organisations. The roll at the Rose Bay clubhouse of the Motor Yacht Club was by April 1918, a testament to the active service of 20% of its membership. So ubiquitous was the honour roll that in January 1916, the Shire and Municipal Supply Company, possibly having noted a lack at the Ocean Street chambers of Woollahra Council, took the lead and offered to submit prices and designs so that the municipality could address this deficiency. As it was, the aldermen had resolved a year earlier to collect the names of local recruits for display, but the proposal appears never to have been implemented. 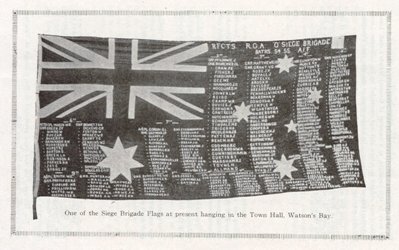 Throughout the war years however, Woollahra Council lent its name to the Rose Bay Patriotic Association, supporting activities which fulfilled a similar function to an honour roll - voicing the community's appreciation of those "answering the call" and publicly upholding their example to other local men. Volunteers were issued with certificates recording their "gallantry", and families presented with large, framed versions of the illuminated words, the work of Sydney-based illustrator and architect Harry J Weston. The Association's activities were underway in November 1915 when, at a lively farewell function in the Rose Bay Hall, certificates were ceremonially awarded to a group of young men soon bound for the front. 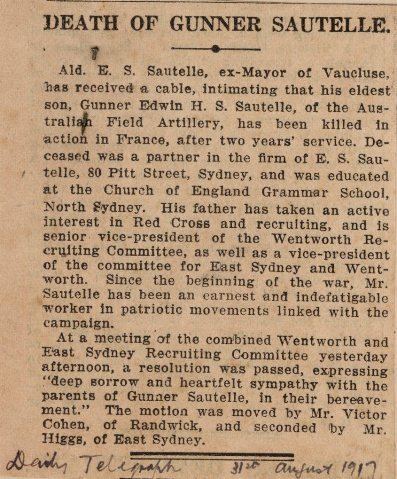 A recently returned serviceman from Rose Bay received an enthusiastic welcome, and an address was given by Henry Clement Hoyle MLA (Mirror of Australia, 6 November 1915, p.15). Local patriotic organisations were advised to appoint strong community role models at their head. 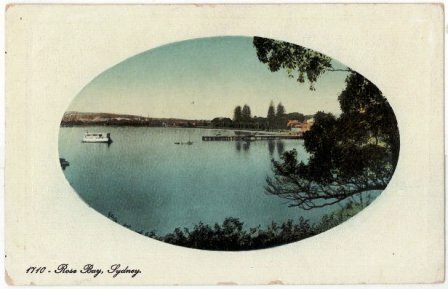 The Chairman of the Rose Bay Patriotic Association was Cecil Alban White, a prominent member of the New South Wales legal fraternity who lived at Wenbourne Rose Bay, while its Honorary Secretary was Percy Hall, the headmaster of Rose Bay Public School. Both men personally signed each certificate awarded to enlistees, with a third signature reserved for the serving mayor of Woollahra Council. A Rose Bay Patriotic Association certificate is held in Woollahra Council's Local History Collection, dating from 2 February 1916 and presented to Rose Bay resident Charles Lambourne Dewley, whose son Charles Henry Dewley also served in the war. The mayoral signatory on Dewley's certificate was Leo Whitby Robinson, whose signature appeared some eight months later on another document - the oath he had himself taken to "serve his Sovereign Lord the King in the Australian Imperial Force", dated 18 September 1916. Woollahra Council also expressed its support for recruits in more material ways. Council guaranteed to preserve the jobs of those of its staff who enlisted, and in another measure signifying council solidarity with patriotic decision, additionally guaranteed to make good the difference between the enlisted man’s army pay and his regular council wages. Council was exercising both supportive principles by late 1915, when several staff signed up for service. Two wartime plebiscites, held to test Australian support for compulsory service abroad, saw Commonwealth authorities appeal once more to local councils for assistance and cooperation. Reluctant to risk senate obstruction of the necessary legislative change, the Hughes government was determined to firstly secure a clear expression of popular good will for its proposed measures before submitting the required amendment to parliamentary debate. Acutely aware of the polarising nature of the conscription question, the government viewed community-based campaigns as one of the keys to building unity and achieving success in the poll. 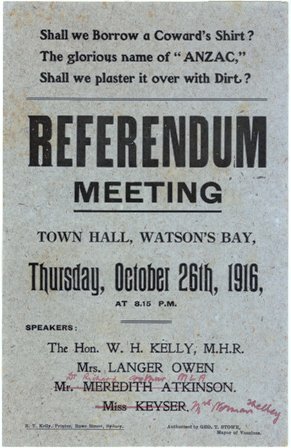 The first of the "war referenda" - as these appeals came to be collectively known - was held in October 1916, and returned a negative result for the government proposition. A second attempt to put the case, in December 1917, was lost by an increased margin. Neither defeat reflected a want of the community effort that the government had requested, but rather a matching degree of conviction and energy on the part of the anti-conscription lobby. Prior to the first plebiscite, a National Referendum Campaign was founded, with committees at State level. Local councils were urged to take the lead in forming district committees, with a brief to reinforce the message within each community. A series of items preserved in the correspondence files of Vaucluse Council confirms the extent of the government's faith in the power of local activism, and its associated reliance on shire and municipal administrations. 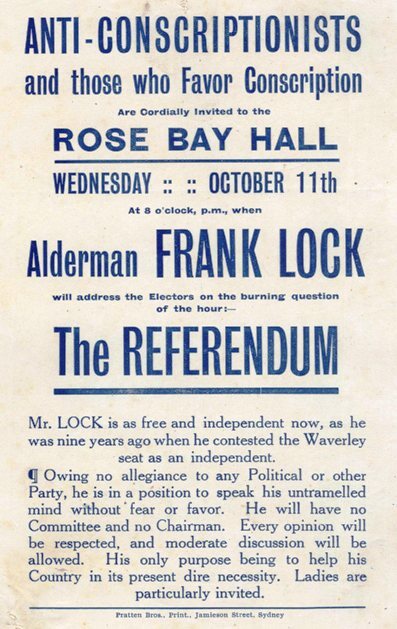 Perhaps the most compelling evidence is a telegram, received in the lead-up to the first "referendum", and sent in the name of the Prime Minister. Referring to the situation as a crisis, the message reminded the aldermen that the nation’s future depended upon "vigor and thoroughness [in] local action". 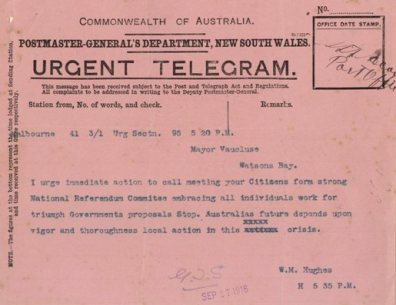 The telegram followed a letter from the New South Wales Premier outlining the tasks envisioned for the Vaucluse referendum committee, once formed. These included canvassing door-to-door, creating and disseminating literature, and organising public rallies to listen to speakers who would be provided by the state referendum committee. This was the first in a series of letters sent from the state headquarters of the National Campaign, with directives and advice for local aldermen. One notable missive sent in October 1916 reminded local campaigners not to overlook the voting power of the women of the district, which might well be harnessed to help carry the referendum. Women canvassers were to be assigned to carry the message to other women, and the committee urged to ensure that every local woman had transport to the poll, and the necessary relief from any "heavy domestic ties" to be available to cast her vote. Above all it was critical to take steps "to endeavour that all women of voting age may understand this vital question". A flurry of public meetings representing both sides of the debate preceded each of the plebiscites, respectively. 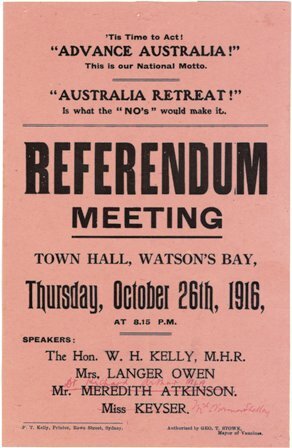 Advertisements posted in the pages of Sydney dailies for these assemblies – many of which took place on street corners, illustrate the high level of public engagement. Taking as a random sample one single issue of the Sydney Morning Herald, published some three weeks before the 1917 poll, it is interesting to note that almost half the column space on a broadsheet page of "classifieds" was devoted to notifying of "pro" or "anti" meetings, Sydney-wide. 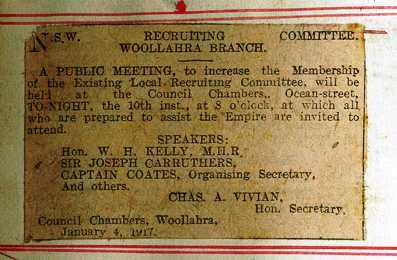 Four pro-conscription meetings were being advertised in various parts of the suburb of Woollahra – including one at the Ocean Street chambers of Woollahra Council. However, four anti-conscription gatherings were also advertised in the same suburb, suggesting a balance of views (Sydney Morning Herald, 27 November 1917, p.11). Some of the most spirited of exchanges occurred in Paddington, with the level of interjection and disruption on occasions leading to arrests. When, in October 1916, a "pro-reinforcements" meeting at St Matthias's Church Hall was forced to a halt by rowdy opponents, the anti-conscription imposters continued their own rally in the street once the original meeting had dispersed. At least one of the disruptive elements faced Paddington Court ten days later, confronted with a choice of a 10/- fine or seven day's imprisonment. (Sydney Morning Herald, 12 October 1916, p.8 and 24 October 1916, p.5). On the other hand, John Percy Osborne MLA, the local member for Paddington, who was well-known for carrying the anti-conscription message to a series of hostile country towns, presumably enjoyed his calmer reception on home turf at the Paddington Town Hall, with only a single interjector, who was quickly outwitted by a member of the audience (Sydney Morning Herald, 20 October 1916, p.8). Emotions also ran high in usually tranquil waters. 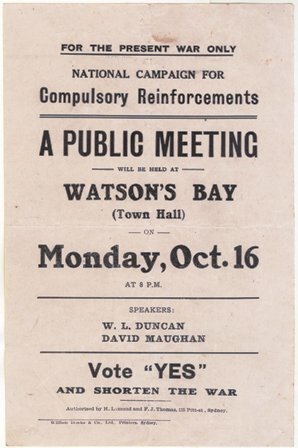 When the Watsons Bay Referendum Committee adapted two lines from Rudyard Kipling's "The English Flag" to spruik the pro-conscription message, its members were unprepared for an angry letter to Vaucluse Council. The complainant was especially surprising - the mother of a serviceman whose son was recovering from wounds in France. Shall we borrow a coward's shirt? The glorious name of "ANZAC," - shall we plaster it over it with dirt? Unfortunately the allusion had been taken at face value, and read as an accusation that Anzacs were untrustworthy cowards who borrowed the shirts of others and returned them deliberately plastered with mud. The offended mother had written to her son of the perceived slight, and relayed his indignant denial to the aldermen, stating that he "furthermore asks me to say that when they return, he and his comrades will plaster the gentleman to such an extent that he will have to dig himself out". Alderman Rose, a member of the local recruiting committee, confessed to having authorised the lines and undertook to write a letter of apology and explanation (Sun, 15 January 1917). The language of the debate remained highly emotive throughout the life of the conscription issue. Women could not be depended upon to toe the pro-reinforcement line, as the National Campaign Headquarters had hoped. While some women speakers upheld the military state model of the ancient Spartans as an ideal, others decried the invitation to "sign the death warrant of our menfolk". Meanwhile, the Single-Man's Protection Association drew on terms such as "victimisation" and "military tyranny" to defend its precarious position (Sydney Morning Herald, 27 November 1917, p.11 and 20 October 1916, p.8). Conscription was a contentious and divisive issue in itself, and once made the subject of a vote, became a vehicle for other causes for disaffection and anti-establishment sentiment. Far from the desired cohesion, the nation fractured along hard-held and predictable political lines. In such an atmosphere, neither government attempt to shore up strength through plebiscite achieved the desired outcome. Australia remained one of only two of the allied forces to raise its troops solely on voluntary enlistment in the 1914-1918 conflict. 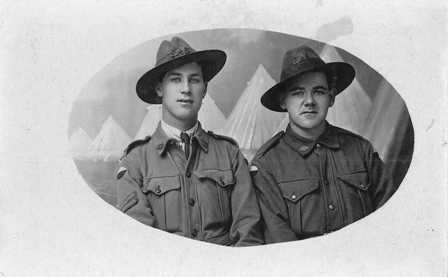 At war's end, 416,809 Australians had voluntarily enrolled for service - estimated at close to 40% of the total male population of military service age.